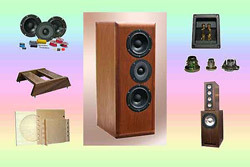 QTA Systems, The home of loudspeaker kits and speaker parts. QTA Systems was established in 1991,specialising in the development and manufacture of high quality loudspeaker kits for DIY enthusiasts. Our product range now includes audiophile cd's, loudspeaker components and loudspeaker kits which can be supplied partly or wholly as DIY for the audio enthusiast. All loudspeaker kits are made to order and on most kits it is possible to offer a choice of veneers and finishes. Take a look at the range of speaker kits and components available and information on how we can help you advance your very own custom speaker designs. In addition a collection of Articles covers some of the more interesting aspects of DIY builds not normally found elsewhere. STS Digital is one of the leading audiophile recording studios in Europe who still use the analogue (tape) medium where possible, to provide the best musical sound and dynamics. Located in Holland, they have produced many fine demonstration CD's for major companies, including Marantz. With their in-house MW recording process they have developed their own unique sound from studio masters for both CD and LPs for you to enjoy. Adding to the choice of the highly popular Bitumastic Damping Sheet is a further material thickness of 1.5mm. This is available as a self-adhesive cut sheet size of (200 * 300)mm. Sorbothane. A newish high tech material with the ability to convert mechanical vibration into heat. Used in high tech electronics for vibration isolation, This material is now available in hemispheres of assorted size and hardness for the support of bass bins, loudspeaker enclosures, microcosm photographic platforms etc. A new range of bi-stretch loudspeaker Grille Cloth available in a selection of colours to add some new visual appeal to legacy hi-fi items such as gramophones and radios. Of course, also available for re-dressing the front panels of more modern enclosures or damaged grilles.